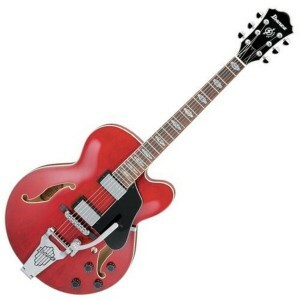 Home > Guitars > Ibanez AFS 75T – Rockabilly cool at a great price! The Ibanez AFS 75T has all the cool retro sophistication of a Gibson or Gretsch hollow body but is a fraction of the price! I have always liked the Gibson 355 and 335, there is something just so special about the look and feel of the guitar. However, the price tag means that I doubt that I will ever own one. Nope sadly for the likes of me the only option is to go for a slightly cheaper imitation and so I was pleased to take a look at the Ibanez AFS 75T. The Ibanez AFS 75T is a semi acoustic guitar cut from the same mould as the Gibson 355 and 335, its rock-a-billy heritage just oozes from every pore. The body is made from maple which gives the guitar a real solid feel and a bright but warm acoustic tone. Unlike the Gibson 335 and 355 with the double cutaway either side of the neck the Ibanez AFS 75T only has a single cutaway a bit reminiscent of the Gibson L5 but access to the upper frets is still good. The neck of the Ibanez AFS 75T is made from mahogany and is a through body construction giving, what is claimed, a better resonance and sustain. The fretboard is bound rosewood and has 22 medium frets. The Ibanez Artcore neck has a slim design which makes it comfortable to play and, with the lower cutaway, ideal for jazz style licks up and down the fretboard. In terms of electrics the Ibanez AFS 75T comes armed with Ibanez designed ACH 1 and ACH2 humbuckers in the neck and bridge positions respectively. The ACH humbuckers provide a clean warm sound with the neck pickup giving a nice thick chunky sound which has a re-assuring growl when the gain is turned up. The bridge pickup is also very lively with a punchy crisp tone which sounds amazing played clean with a hint of reverb. The pickups can be accessed through a 3 way selector switch and each pickup has a dedicated tone and volume control to maximise the tonal control. The bridge of the Ibanez AFS75T is an ART-2 roller bridge combined with a VBF70 tailpiece. The VBF70 is a licensed Fred W Gretsch vintage vibrato unit which, with the roller saddles, eliminates the tunning issues that you often encounter with this old school vibrato. Certainly you can’t do any manic whammy bar divebombs but for gentle pitch bends this is a great bridge and certainly doesn’t detune as badly as some cheaper units. To sum up the Ibanez AFS 75T is a really good guitar. It is well put together with fantastic attention to detail and the sound it produces is amazing. It may not have the pedigree of a Gibson or Gretsch but when you consider the price tag this is one hell of a guitar and I can highly recommend it.